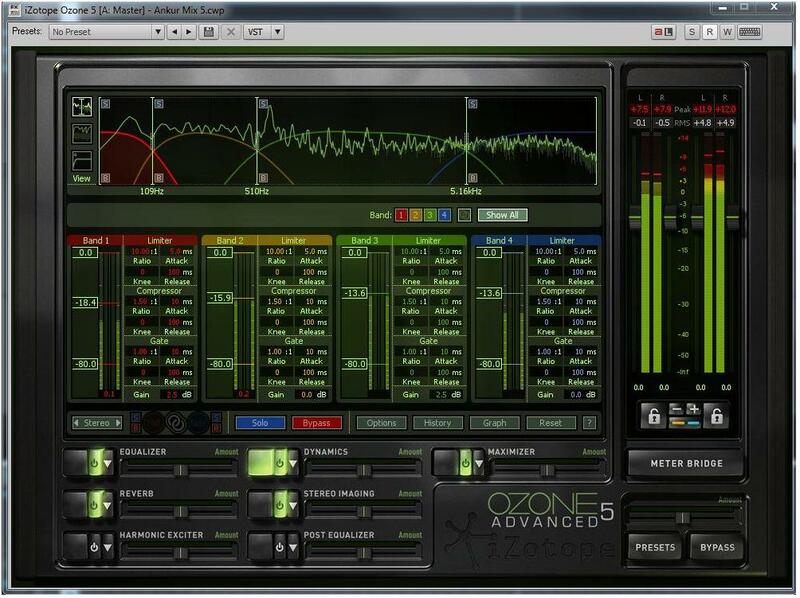 On a couple of occasions I tried using various mastering tools to rectify some of these problems. However the deal breaker was always the faulty imaging – anything I did would ultimately end up negatively affecting the rest of the mix without adequately addressing the fundamental problems. While working on SONAR X2 earlier this year, I saw R-Mix’s abilities to isolate a voice in a stereo field and remembered this project – would R-Mix be the tool that to use to fix that mix? I’ve always been a fan of Roland’s V-series technology, so the idea of virtual remixing piqued my interest. A few of weeks ago I decided to revisit this project and started doing some experiments. I loaded up one of the more problematic tunes from the project. The synth voice was way too dominant in the mix and the overall frequency balance sounded very harsh. I set up a track containing the stereo wave file with R-Mix in the effects bin. In a few seconds I was able to isolate the instrument in the mix. I then simply dropped the “inside” level in R-Mix and panned the voice slightly to the right to move it closer to the center. 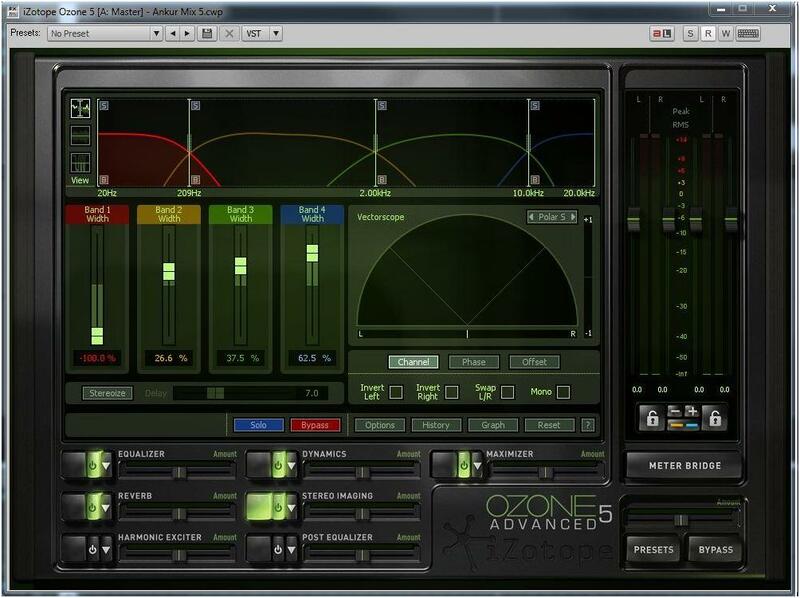 This immediately solved the harshness and problem of the voice dominating the mix and resolved much of the hard panning problem. Amazingly there were no perceivable artifacts in the rest of the mix after doing this. I was blown away! So I began experimenting with the other tunes and found that by using a combination of techniques I could pretty much solve the worst problems in the mixes. I set up a template project with one track for the stereo wave file and two pre-fader sends going to two buses each containing an R-Mix instance. From the first bus I could isolate the voice of interest and from the second I would get the rest of the mix minus the voice. I could use set theory style Venn diagrams to visualize and extract areas of interest from the stereo mix. With a layout like this and cascading sends I could fix problem areas by creating “virtual stems”. Very exciting stuff! However, imaging and balance were only one aspect of the problems listed above. The other primary issue was the fact that this project had never actually been mastered for CD. It was released on cassette tape from a “cassette master” :-/ I actually was present at the tape duplication facility where I saw the dude there take the final mix tape and make his own “master” by doing a tape to tape copy through some ridiculous mixing board and applying his own EQ to it. Oh man! Anyway needless to say the project needed some mastering love. I have limited time and don’t have mastering chops personally so I needed some help. When I worked on Ramona’s most recent project One of Us, I had a few people critique my mixes. One of them was SONAR user and musician Eric Hansen. At the time I was very impressed with the quality and detail of his suggestions, so I decided to let him have a look at my rough remix work. I was able to share the project file with him since he was already running X2, so he could see what I was doing with R-Mix. A day later he sent me back a new version that was way better than my initial mix, had more air and space, the middle was improved and it also fixed the worst of the other problems. Amazing, I could actually now listen to the tune without being distracted by all the bad stuff! Eric has terrific ears and attention to detail. I was so impressed that I contracted him to do the rest of the project. We’ll visit the techniques used to clean up the mix for one of the songs, Ankur. Let’s first listen to the original and the final remixed and mastered version. Although the final mix is far from perfect, considering that we started from a stereo wave file its pretty impressive what we were able to achieve in the final version. It sounds fuller and much better balanced and the worst imaging problems are corrected. Upon first listening to the tracks from Sound Matters, I realized I was going to have to overcome three troublesome areas in order to improve the original mixes. 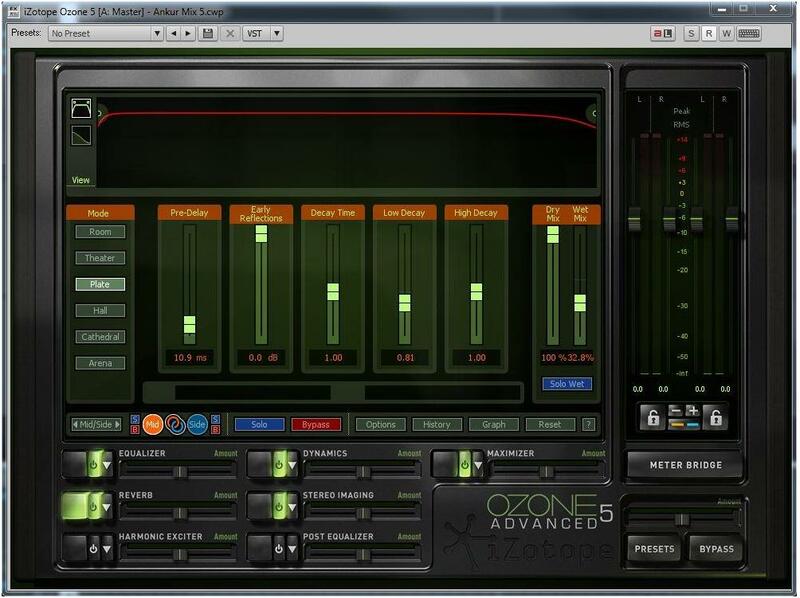 These challenges would be overcome through the use of R-Mix Sonar Edition and Izotope’s Ozone 5 Advanced. The first track I worked with was Ankur. This proved to be a good starting point since the track exhibited all the problems listed above. The drums were panned right and the melodic instruments were panned left. As a result, the stereo image was unbalanced. The original mix reminded me how the Beatles did their stereo mixes. While this can provide clear separation between instruments, the center sounded empty. The inside level of the filter is boosted slightly while the outside level is completely removed. Removing the outside level isolated the cymbals and snare from the original mix. When adjusting the drums with R-Mix, a filter was used to isolate a small section of frequencies and double them to the opposite side to create a balanced image. For the synth guitar, I wanted to lower the level of the instrument within the overall mix. To do this I first had to reduce the outside level completely and move the filter around until I found the sweet spot for the synth guitar. Then, I brought the outside level back to zero and adjusted the inside level until I felt the synth guitar was more balanced with the rest of the instruments. Next, I automated the bypass function of R-Mix so the filter would only be applied when the synth guitar was playing the melody. X2’s new automation lanes made viewing and editing automation easier than ever. Using the updated Smart Tool functions in tandem with expanded lanes allows for quick edits and easy copy and paste operations. I also like the ability to reorder the lanes in a way that reflects the signal chain of a track or bus. For example, if I have the EQ module before a compression module in the Pro Channel the envelopes can reflect that same order. 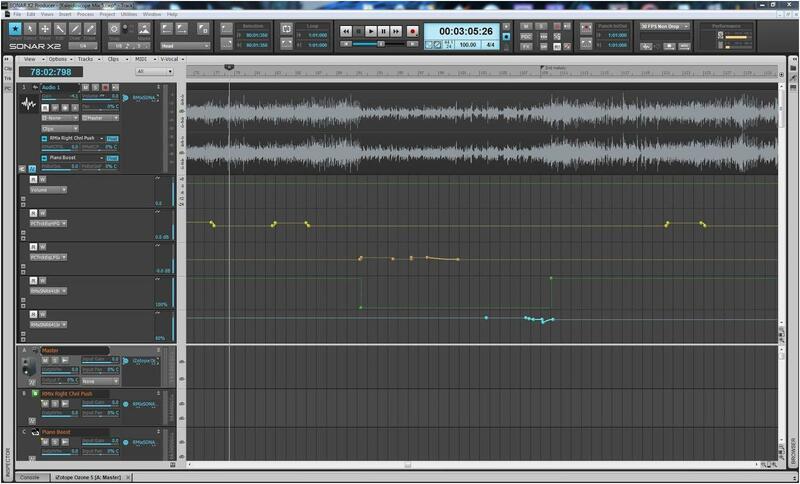 In the screen shot below envelopes are automating track volume, EQ adjustments and R-Mix settings. The customized order of the envelopes reflects the signal chain: Volume, EQ to R-Mix. Another new X2 feature, and my favorite, is the Console Emulation. For Ankur, I used the S-Type emulation on the track and mix bus because it warmed up the lows nicely. I usually start with the drive set to 3dB and adjust from there. On tracks and mixes that benefit from more warmth in the lows but need a little more shimmer up top I use the N-Type. The A-Type is good for tracks and mixes that need a little more air up top. 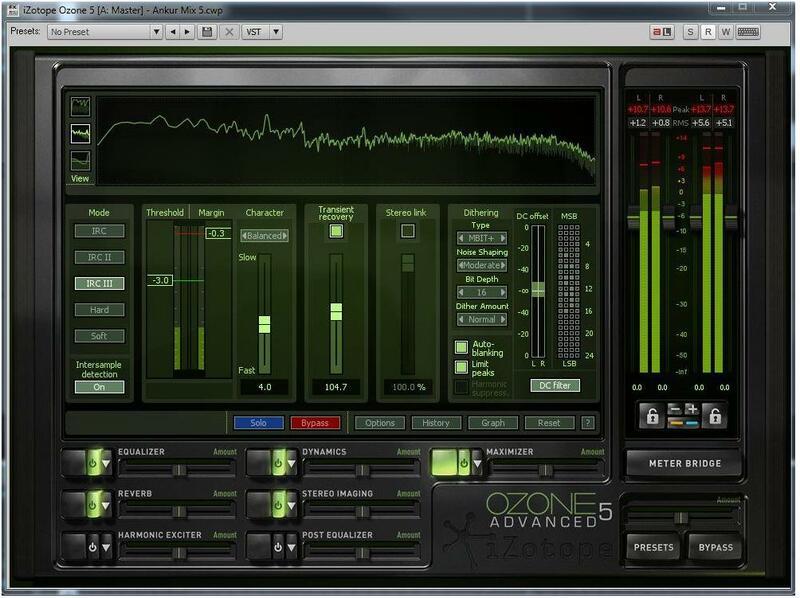 Now that the instruments and image were balanced, it was time to move on to Izotope’s Ozone 5 Advanced and apply the mastering. The main adjustment needed was getting the bass and kick more present in the mix while opening up the top end. 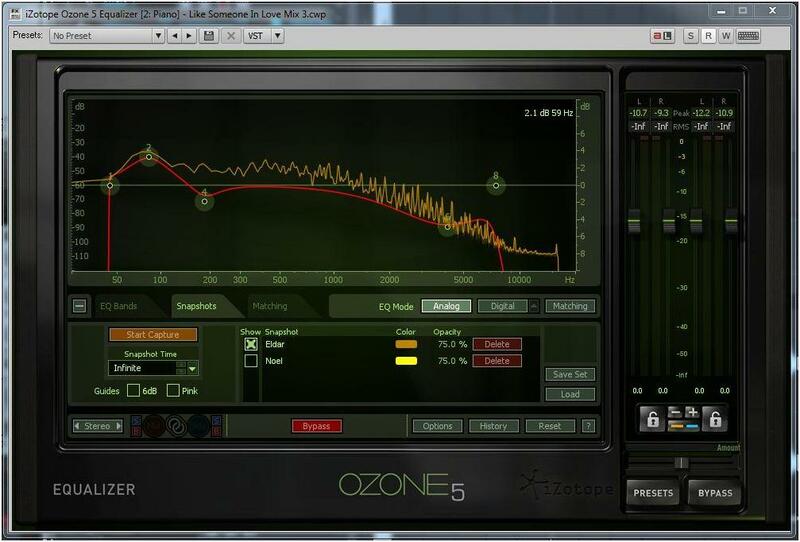 I used Ozone’s Equalizer in Mid/Side mode to achieve this. I boosted the low end around 75hz in the mid channel and used an aggressive high shelf on the side channels to add lots of air to the overall mix. 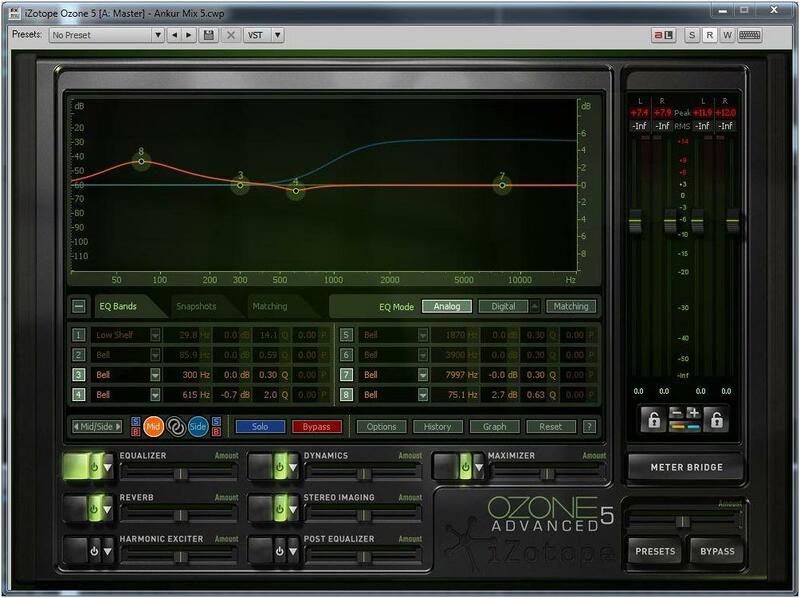 I used the K-System metering set at K-14 in Ozone and kept the RMS around 0. On the remaining tunes I used a combination of the above techniques to widen the mixes and give them more dimension. 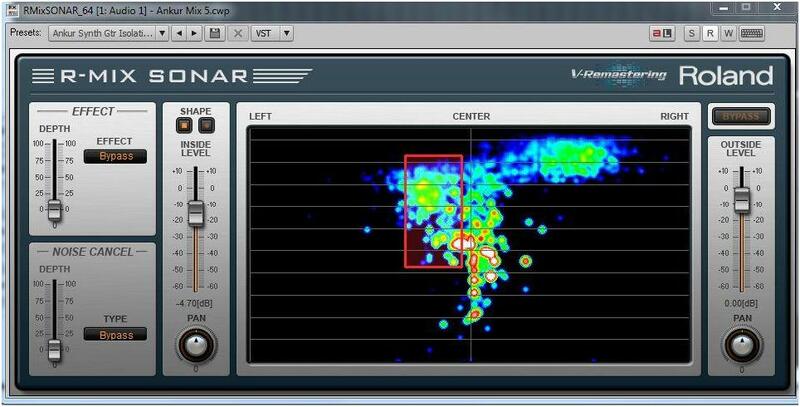 R-Mix was the main glue to address similar stereo imaging issues that were prevalent in the other tracks as well. Some tunes were more troublesome than others since the pan would move during the course of the song making it difficult to get R-Mix to track its region of interest. In such cases its possible to automate the position of the window dynamically, though it can get harder to track if the pan changes are abrupt. On the track entitled Dream Theme there was an issue with tape noise that needed to be addressed. The track is a piano and guitar duet with an arrangement that can be quiet at times. Tape hiss and a low end rumble were present throughout this track which I found distracting. I used a noise reduction plug to address this and it worked very well. On Like Someone in Love there is a lovely piano introduction that sounded harsh on the original recording (due to the bright sound of the digital piano). I ended up cutting the piano intro from the main part of the tune and processed it on a separate track. I used Ozone’s EQ matching feature to measure a solo piano recording from another artist and applied it to the piano intro. The EQ was curve was aggressive but the results were quite dramatic. In the screen shot below you can see the response curve of the solo piano I measured and the EQ curve applied to match it. The purpose of this article has been to illustrate how you can use the tools in SONAR X2 beyond their primary functions in music production. R-Mix proved to be an invaluable resource to remix/remaster this project starting from a relatively rough stereo source. It would have been impossible to do “virtual remixing” without the help of R-Mix to resurrect this project and fix some fundamental problems that would normally require the multi track audio files or instrument stems at minimum. 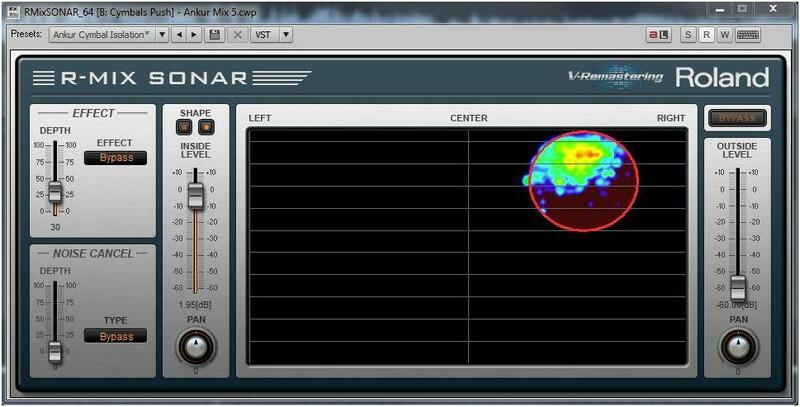 If you do mastering work or have to work with just a stereo source files, there are many cases where R-Mix can allow you to make subtle changes to imaging very simply. Mastering and remixing are not the only uses of R-Mix however. It can also be used on tracks to do all kinds of interesting dynamic phase and imaging effects by using its automated parameters. Many thanks to Eric Hansen for his meticulous restoration work on this project and for documenting the techniques and process used. He rescued a project that I had once considered irreparable! Eric can be reached though his website. If you’d like to listen to the rest of this project, you can access it here on Bandcamp. Its free while my download credits last. 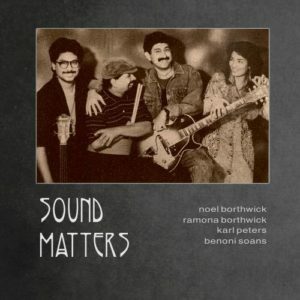 The musicians on this project were Ramona Borthwick (piano), Karl Peters (bass), Benny Soans (drums) and myself. The music we recorded for the project were some compositions and jazz standards. At the time I was experimenting with guitar synthesizers and trying to use synth voices within a more traditional jazz format rather than the electronic music medium. I’d been doing this for a few years with a Roland GR-50 (one of the early Roland digital guitar synthesizers), so most of the project features me using a guitar controller setup instead of electric guitar. I was fairly comfortable with the idiosyncrasies of using this controller at the time, so if nothing, the recording is a synth guitar demo! On some tracks, I double the synth voice with the guitar, to complement the guitars attack with the synth voice texture. Exceptions are Ankur and Dream Theme which use acoustic guitar, and Ross’s Samba is electric guitar. The percussion on this tune was tracked live from the guitar controller. In hindsight, while synth guitar can be interesting in moderation, I personally find that digital instruments in general (esp those from the 80’s!) don’t withstand the test of time like real instruments do. Hey at the time I was young, reckless and needed the money – that’s my story and I’m sticking to it 🙂 Although I don’t use synth guitar anymore, that period was instructional to me and I learned how to phrase more like horn and wind instruments. It was also a segue into my first forays with sequencing and ultimately Cakewalk! The featured song Ankur is one of Ramona’s early compositions. The roots of her thematic writing style, evident in her more recent compositions are visible here. Dream Theme is one of the first tunes I wrote, and the two of us collaborated on the writing of the other tunes.